In 1997, Ron and Linda Beaumont opened the doors of their North Texas ranch to the public, sharing their love of the culture and the land in this part of the Lonestar State. Twenty-one years later, Beaumont Ranch remains a rarity in the hospitality industry, as many family-owned resorts have come under out-of-state corporate ownership. What began as a modest handful of guest cabins has evolved into the sprawling 800-acre vacation destination of today. Even with the growth, the Beaumonts stay faithful to their roots, putting family and the Grandview community at the forefront. ​ Let our staff and family show you our own slice of the great state of Texas on your next adventure. Beaumont Ranch is a unique mix of modern amenities and rustic charm. The existing structures from the 1997 purchase were revitalized and reflect the Beaumont family's sense of style and incorporate it into a modern Texas lifestyle. Beaumont Ranch sits on the old Chisolm Trail, used in the post-Civil War era to drive cattle overland, from ranches in Texas to Kansas railheads. The Western Town reflects Texas in the 1880's when cowboys were driving their herds through the land. The rustic style buildings are also guest houses and luxury suites behind the doors, which make it a favorite for guests, event planners, and television and film production personnel. Keeping with tradition, Beaumont Ranch is not just a resort, but a working cattle ranch. The Beaumont Ranch herds of Longhorn Cattle and horses are a favorite for fans of wildlife. 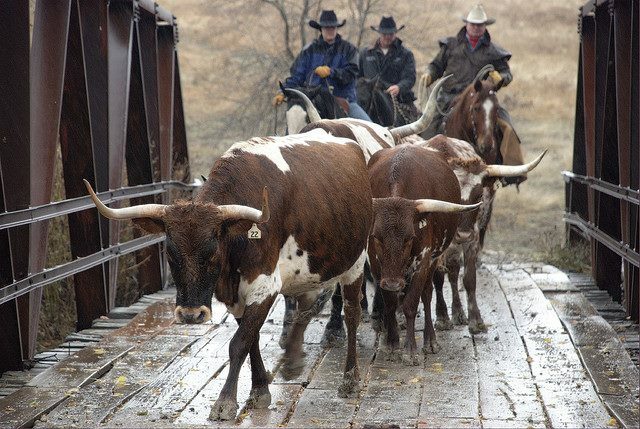 Many of the Outdoor Adventure Activities let our guests interact with these animals, including learning how to drive cattle just like the great cowboys of Texas did on this land years ago. Many of Beaumont Ranch's clientele are locals from the Dallas and Fort Worth area, visiting us for a relaxing getaway, an adventure-filled trip, special events, birthdays or weddings. It's the ideal spot for a family reunion, vacation, or a romantic getaway for two. This is also a place for people outside of Texas to get a taste of the Western lifestyle and culture. We pride ourselves on being family-friendly but also having a focus that is ideal for the single adventure-seeking traveller. Beaumont Ranch is not simply for vacations. If you are seeking a place to host the perfect corporate retreat or team building event, all the amenities of a resort and conference center are available as well.